Costa Rica is a country that has plenty of influence from the United States since plenty of expats and American families live in the country. Ticos even adopt some of the typical holidays, for example, Thanksgiving. This is one of the most celebrated holidays for families and friends in Costa Rica. We must take into consideration that there are more than 100,000 Americans living in Costa Rica, many Ticos have also lived or studied in the United States, also some have family influence from North America. Despite this, there are even families without American influence that tend to celebrate this holiday since it is a great excuse to get together and cherish loved ones. Each year the amount of people that celebrate Thanksgiving in Costa Rica increases. Supermarkets are running out of turkey more and more during November. It is well known that Thanksgiving has a cultural, historical and patriotic connotation for the USA. Nevertheless, Costa Ricans find the essence of this Holliday something of value and worth of celebrating. Why not celebrate a day where the main purpose is to give thanks? At the beginning of November, you already start to feel a festive climate in the streets. Trees start lighting up and even the days are chilly but sunny, the best months to spend time outdoors. It is natures way to welcome the most beautiful celebrations that Ticos will experience during the months of November and December. Thanksgiving celebrations happen all over the country. Restaurants tend to have special menus and supermarket have sales on all of the ingredients needed to complete the perfect dinner. If you are foreign looking to eat turkey and mashed potatoes, you will find it here, keep in mind that flavors can be a little different from traditional ones, more tropical. 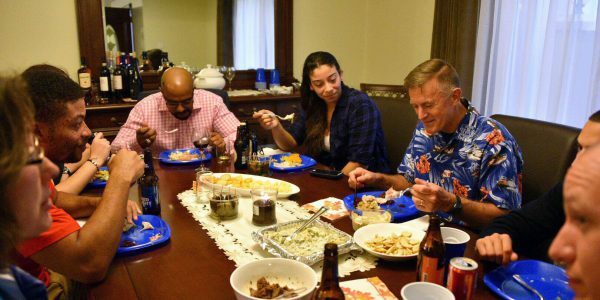 Thanksgiving is even celebrated in beach towns like Jaco or Tamarindo where there’s a large concentration of American residents. Most of the expats tend to get together with other expats that become part of their family while living outside the USA. Celebrations in Costa Rica include the typical dinner. It can be at restaurants or at family homes, but always with great company and tons of food. Some people rather spend this day at the beach or in “miradores” which are outlook places in the mountains that overlook the city or the ocean. Some families even adopt the tradition of mentioning all the things they are thankful for. Others write phrases of what they are thankful for and hang them in the Christmas tree. There are more creative families that even light up balloons with letters attached and set them free, sending their gratefulness everywhere. Thanksgiving is a great occasion to open a good wine, invite family and friends and set up a pretty table to enjoy a grateful dinner with good company. Ticos are proud of being ticos and having their own traditions, but a day to be thankful amongst loved ones is certainly a good celebration. Air Fest 2019 – There is always something going on in Jaco! During February 8th, 9th and 10th Jaco will be hosting one of the most peculiar parties in Central America: the Jaco Air Fest. Jaco is a town known mostly for it’s surfing waves and beautiful beaches. Little is known that it has great potential for air sports. This is one of the main venues for free flight in the region. This party will be held with the purpose of promoting sports, culture and recreational activities in order to create an impact in the community. The festival will count with exhibitions and competitions of different disciplines. Some of the disciplines you will be able to watch are paragliding, parachutes, trikes, and turns, hang gliding, hot air balloons, and model airplanes. However, the highlight of the air fest is the acrobatic exhibitions. There will be exceptional international athletes such as the Spanish cousins Raul Rodriguez, multi-world champion of acrobatic paragliding, and Horacio Llorens aerobatic paragliding world record holder. Raul Rodriguez is inviting everyone to be part of this fantastic international air fest. It’s a particular event that will be worth watching! With this, there will also be acrobatic shows, pilot encounters, a championship of precision landing, flying tours and adventure fair between others. There’s also the option of renting boat tours and watching some the activities from the shore. This international festival will also be held in a manner that it respects the environment and the communities nearby. There will be activities for kids, where they can learn about these sports and the safeness procedures it implies. Some other attractions that you will find in the festival are playing zones for kids, shops with souvenirs and handcrafted local goods, food trucks, picnic area and more. During these days the sky will be full of colors and movement. It will be an event hosted for everyone, families, athletes, pilots, and businessman. The exhibitions and shows will be remarkable, a great way of getting to know some of these air sports. Watching this fest is totally amazing, a must see if you are in the area of Garabito during February. It is a party in the air! 2018 has been one of the best years for the conservation areas in Costa Rica. Past Saturday, October 27th four jaguars were spotted hunting on the beach of Tortuguero National Park. It is well known that there is a population of Jaguars that inhabit the place but are rarely seen. Having four of them at the same time indicates that this population is stable and increasing. This progress has to be attributed to the guard parks, MINAE, and SINAC for the conservation of these national parks as well as the flora and fauna. This year the shore was totally covered with turtles that arrived to lay their eggs. It was one of the best years to watch the “arribada” as we experienced a larger population of turtles. This can be a good explanation of why the Jaguars can be actually increasing. Tortuguero National Park has been doing an exceptional job on the conservation of the green turtle which makes this population increase; as turtles increase the jaguar population does also. Experts explain that there are actually 15 to 25 of these felines in Tortuguero National Park. In 2017, the park closed some of the areas where these big animals inhabit to maximize the conservation of the species as well as considering the security of the visitors. National Geographic launched a documentary about jaguars in Costa Rica. Here they showed how the biodiversity in our national parks is abundant and able to satisfy the needs of these felines. There were two cases that back up this theory. First, it’s well known that big cats don’t share their food, they actually compete for the prey. Nevertheless, showing how surreal Costa Rica is, there was evidence of two male jaguars sharing a turtle, eating out of it at the same time. In the same conservation area, they planted several secret cameras that captured one feline dragging a heavy and strong turtle for dinner. A few hours later, two other Jaguars, at two different times, approached this prey that was left in the jungle uneaten and finished it, leaving only it’s shell: Three jaguars ate the same prey. These behaviors show how big predators have an abundance of food in the area which allows them to share and not to compete. Jaguars are considered as a key factor and an indicator species of the ecosystem. Depending on the number of felines found on the area the biologists can have an approximate idea of the different factors, such as hunting, habitat changes, prey amount, water fountains, and others, are affecting. Their activity depends completely on the number of preys, if there is enough food they will active hunters looking for food, and that’s when we are able to see them and study them. Likewise, when the smaller animals that inhabit the area or the preys are well conserved, so will the Jaguars. There is a prove that Prey and predator have a correlational relationship, as one population increases the other will increase as well. If both populations are increasing this is a great indicator that biodiversity in the place is perfectly fine and conservation efforts are efficient. Costa Rica is the only country in the region where the jaguar population is increasing. Nevertheless, there’s much to improve. Urbanization, deforestation, contamination, land fragmentation are just some of the factors that are harming these animals and their stability. Citizens and tourists have to make an effort and keep contributing to the astonishing job of the park rangers, MINAE and SINAC.